Somewhere along the way, Malbec became the “it” grape. Its powerful black fruit flavors, unique terroir combined with the ability to drink it in its youth, along with its generally reasonable price point, has made it a trendy choice on dinner menus and for summer cookouts. Since whenever that officially happened, Argentina has flooded the marketplace with the grape, and it has become harder and harder to separate the best of the bunch from the generic swill. Thankfully, there are still several quality producers that offer high quality wines at values that remain second to none on the world landscape. Malbec originated in the Bordeaux region of France, and is used there in small quantities as a blending grape to add youthful complexities to those famous wines. Some of the best Argentinian Malbecs are also blended with other grapes, and the wine I have selected to feature this month benefits from such balance, and at a fantastic bargain. 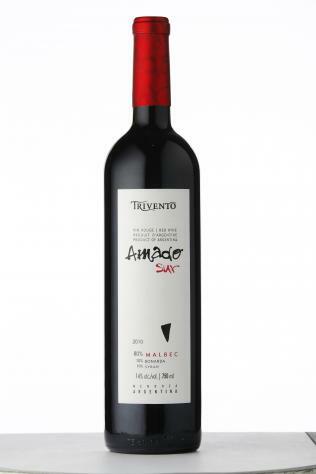 Trivento Amado Sur Red Mendoza 2010, 90 Points, $15, 35,000 Cases Produced- Dark aromas of black fruit and iron. Rich and deep, with blackberry and black plum above spicy pepper, dark chocolate and charcoal. Soft and velvety tannins through the long finish, spice lingers. Malbec, Bonarda and Syrah. Turn back the clock to the first Saturday in May, and I was using three horses to start off my Pick 3. A tough horse named Great Attack knocked me out right off the bat as the three horses I used finished right behind him in the 2-3-4 spots. I’ll use those three again to start a chalky pick 3 Saturday. As I did that day, I’ll take a shot on GREAT MILLS for the win. He ran well to finish 2nd in the Shakertown Stakes over this course back in April, and led most of the way in his last outing before being caught for 2nd by one of today’s foes, Chamberlain Bridge. However, this front running type figures to carve out a lead from outside the speed, and I’ll give him a chance to hang on for the win over a course he’s familiar with. BRIDGETOWN should be right with him and always hangs around for a piece, while the speedy Will’s Wildcat, who makes his 2nd start on turf after a 3rd place finish in his debut, ensures some pace up front as well. This bodes well for CHAMBERLAIN BRIDGE to factor late as he usually does. Icon Ike was 2nd in his last start at Kentucky Downs at 6f, while Ginplay and Wekiva Wachee appear in over their heads here. Unless she falls down, this race should be all GROUPIE DOLL, who has been dominant in her last three starts against much stronger fields than this. She shortens up to 6f in her second race off a four month layoff, but has won her last three races going back to April by a combined 13.5 lengths, including a 7f win over this course. She will be a strong single in my early Pick 3. If you’re looking for value, HONEY CHILE was an impressive six length winner of an allowance optional claiming race just last weekend over Arlington’s synthetic surface. SALLY SALLY was beaten only four lengths by the top choice in her last outing and merits a look in exotics. Emma’s Encore is another coming off of short rest following a disappointing 6th place finish in the Gallant Bloom two weeks back, and while freshness is a concern after that effort, she had won two graded stakes in her two starts before that. Zermatt finished off the board at Woodbine in her last start, while Strike The Moon missed the board as well at Saratoga. The last time that Daisy Devine and Tapitsfly met at 8f was in the Churchill Distaff Turf Mile on the Kentucky Derby undercard, and with so much early pace, the race set up well for a stalker. In this race, I expect to see added pressure on the front end from Summer Soiree, who came off a long layoff to finish 3rd in her first outing of the year at the end of August in the 8.5f Ballston Spa Stakes. She was easily beaten for the place spot there after leading the first 6f by the horse that won the Churchill Distaff Turf Mile, HUNGRY ISLAND. She hasn’t found the winner’s circle since then, but her 2nd place finish in the Ballston Spa was flattered when the winner of that race, Zagora, put in a game effort last weekend in the Grade 1 Flower Bowl. The pace scenario sets up well for her, and she has been consistent all year. Of the three aforementioned speed factors, I probably prefer TAPITSFLY most despite a puzzling, flat 6th place effort in the Ballston Spa where she was never able to make the lead. If she can run back to her game 2nd in the Churchill Distaff Turf Mile or to her front running win in the Just A Game Stakes on Belmont Day, she has every right to contend for the win here. DAISY DEVINE won over this course back in April and actually beat Tapitsfly in that race, but she hasn’t raced since May, and she’s done her best running after getting away with easy fractions, which isn’t likely to happen here, but she should hang around for at least a piece. Summer Soiree figures to be a pace casualty off her lack of 2012 seasoning, while Snow Fall and Brilliant Future take a big step up in class here. This is easily the deepest and best betting race on the card, as 14 two year old colts get after it in a fairly wide-open contest on the polytrack in which a case can be made for most of them. I watched in person as PATAKY KID stalked the pace and pulled away driving to easily win the Arlington-Washington Futurity last month with Garrett Gomez aboard. He’s the only horse in the field to have won twice over a synthetic surface, and the only one to win at all around two turns over synthetic, and he has done it with fairly competitive speed numbers (71 Beyer, though his Equibase numbers are much higher). He has a lot of upside at a decent price here, as he put in a solid 5f endurance work over the Keeneland surface in 1:00.60 last week after running 1:00.0 before that at Arlington. Another colt that could be overlooked is JAVA’S WAR, who overcame a tough trip to win an 8f turf race and finished with a ton of gas in the tank in his last start. He’ll be racing on synthetic for the first time, but trainer Ken McPeek has won with a staggering 27% of his entrants at Keeneland switching from turf to synthetic. Looking toward the pace, TIZRACER enters with a field high last race Beyer (92) in a front running 10 length maiden win over the dirt, but only faced four horses in that race. Still, I’m a sucker for Tiznow colts, and they usually adapt well to synthetic surfaces, so he must be kept in the mix. Joha will be forced to go early from the rail and could enjoy a front-running, ground-saving trip, and is the only colt in the field to have ever raced on this track (2nd at 4.5f back in April). He led all the way in the 8.5f With Anticipation Stakes over the turf before behind nailed at the wire by BALANCE THE BOOKS, whose deep closing style may not play quite as well down the short Keeneland stretch, but still must be considered a candidate for the win based on that effort, which saw him come from last to first after swinging six wide on the turn. Both horses will be moving from turf to synthetic for the first time. Also worth consideration coming from off the pace are Dynamic Sky, who also boasts a hard-closing 6.5f win over synthetic with a field high 90 Beyer over that surface, and Are You Kidding Me, who was moving late to grab 2nd in the 8f Summer Stakes over the turf at Woodbine after a tough trip. Adding to the early pace could be Craving Carats, a Street Sense colt who broke his maiden in an easy front-running trip before finishing 8th in the With Anticipation after a rough trip but posted perhaps the best work of all at Keeneland among the contenders after that (5f in:59.80), and Dipsey Drew, who looks a touch slower than the top horses here in terms of figures and would need to take a step forward to impact the tote board. Charming Kitten will take some action here but didn’t really have an excuse for hanging in the stretch in a 3rd place finish in the With Anticipation, but could benefit from the switch to synthetic- he’s a full brother to synthetic winner Queens’platekitten. Rounding out the field are Positively, who stretches out from a late running 6f win, as well as longshots He’s Had Enough, Tree of Life and He’s So Fine. Some of the very best turf milers in the country meet for this race, where I expect to see solid fractions on the front end thanks to the combination of several speedy front runners. This should bode well for DATA LINK, a closing type that does his best running coming from well off a strong pace. He has a win over this course at the 8f distance from April, and should get more to run at this time than he had in his last outing, a 2nd place finish behind wire-to-wire winner Dominus, who he will see again here. The versatile WISE DAN will use this race as a Breeders’ Cup tune up and will likely be close to even money here. He’s a must use in exotics and multi-race wagers, and I expect him to sit just off the pace and get first run on the pacesetters in the stretch. DOUBLES PARTNER is a bit of a wild card here coming off a five month layoff. He probably ran best of all the closers in his last outing, a 4th place finish in the surprisingly paceless Woodford Reserve Turf Classic on Derby day. Before that, he was 3rd in a blanket finish over this course to the top choice at 8f in a race with much quicker fractions on the front end. Another closer that deserves a look is Corporate Jungle, who ran an easily beaten 2nd to the second choice in the 8f Fourstardave, but has yet to actually beat top competition. The speedy Silver Max has a win over this course and is a major threat at this distance off his prior form but takes a step up in class and is almost certain to get caught up in a stretch duel with Dominus, who lines up next to him, and engage early with cheaper speed longshots like Skyring and Worthadd. Wilcoxx Inn always fires but has yet to beat horses at this class level, while Slip and Drive, Ol Army and Swift Warrior also appear a cut below these.